Mad Dog Weapon Systems > Categories > 6mm Mongoose > cz 527 barrel in mongoose? I just came across a cz 527 varmint in 223, and would like to have a bolt gun chambered in it,to go with the ar, and a pair of mongooses wouldn't get as lonely as a single one. So a barrel and a reamer and guages would be on the hunt down list. They are a dandy little mini mauser action with a nice single set trigger. 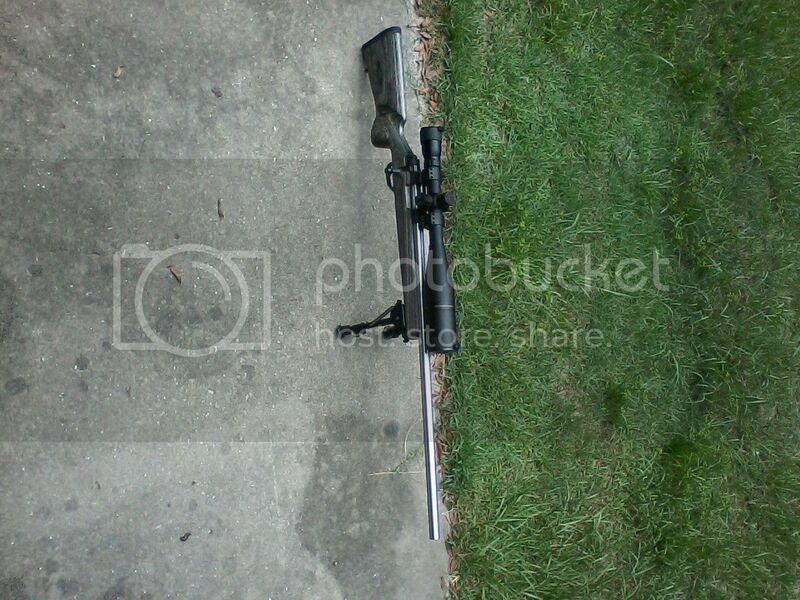 24" varmint contour prefered so minimum modifications to the kevlar stock it has now. if anyone knows where to start on this quest, id appreciate it. I haven't checked with x caliber as far as blanks, but still the issue would be the reamer. I have a gunsmith I can use, unless someone else with firsthand experience in mongoose grooming would be better. In regards to barrel dimensions of a varmint, its as follows, .996 at the face of the action, straight for an inch, then straight tapers down to .700 over 24 or 26 inches. Your only option is to work out something with X-caliber. They have the only set of reamers and gauges. You could send them your receiver and bolt and have them put a barrel on it. Or you could have them deep chamber a blank, and have your smith finish it. Call or email Dustin and see if they will work with you on it. At least I know the direction to go now. Kind of a strange question I know, but I like the rifle, and found a 2 nd one today. Thanks JW, At least I know the direction to go now. Kind of a strange question I know, but I like the rifle, and found a 2 nd one today. I like them a lot too. Miniature mouser with claw extractor and blade ejector, sized for the 223. Perfect for 223 based cartridges IMO. Some of them come with some beautiful Turkish walnut. If they weren't so expensive, I might would try one myself. Thanks for this thread, and I'll be following it. I also like the CZ527 rifles. 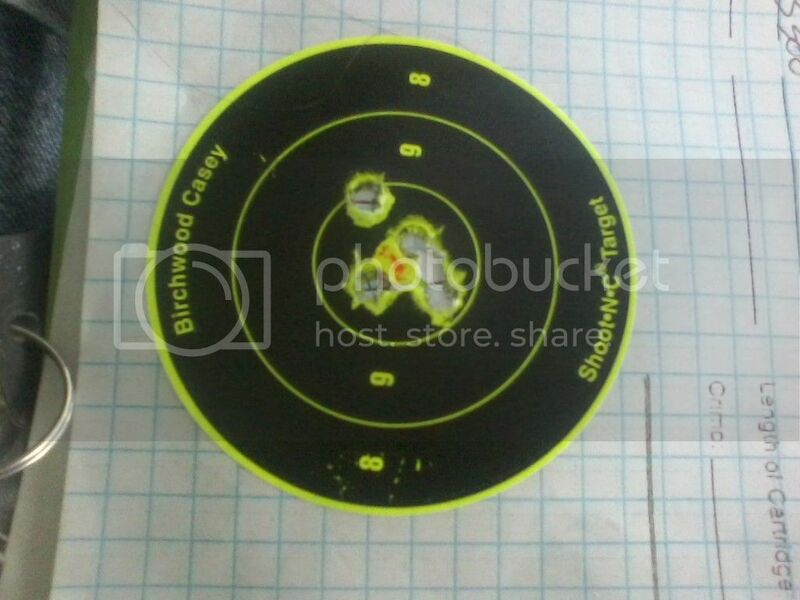 I purchased one last month from Buds chambered in .204 Ruger. Used a local FFL who is a gunsmith with full machine shop. He removed the barrel, cut threads off, re-threaded the chamber end, and chambered in it 20 VarTarg for me. It is a varmint barrel, so I had him thread it 5/8 for suppressor. Having one in 6mm Mongoose would be very nice. I haven't forgot about this, just picked the rifle up today. Have you shot this thing yet? I'm anxious to see how it does. And I need to load some more rounds. I'll try to get it out real soon now that I have glass. and see what it does for first shots. The single set trigger should be nice. Thanks for the help on this JW. That is a beautiful thing! Nicely done!!! Not yet I just got glass a sightron s3 8x32x56 mildot And I need to load some more rounds. I'll try to get it out real soon now that I have glass. and see what it does for first shots. The single set trigger should be nice. I may even load some more 75 v max with some flavor of stick powder Fresh brass for now. Thanks for the help on this JW. And I had 3 boxes of new lapua brass. Seemed like a good idea at the time. That I didn't have turning mandrel and 40 degree cutter. So those should be here by the end of the week. I measured distance to lands in it as well as the ar. The ar has a longer chamber than the cz. So I'll base my seating depths off it, allowing a 0.020 jump. The ar will have anywhere from +0.013 to +0.030 longer depending on bullet used. I should be able to find something it likes Powder wise with what I have. I'm looking forward to shooting it. It will be single loaded, I'm not overly concerned about mag feeding, but a 87 v max would fit. 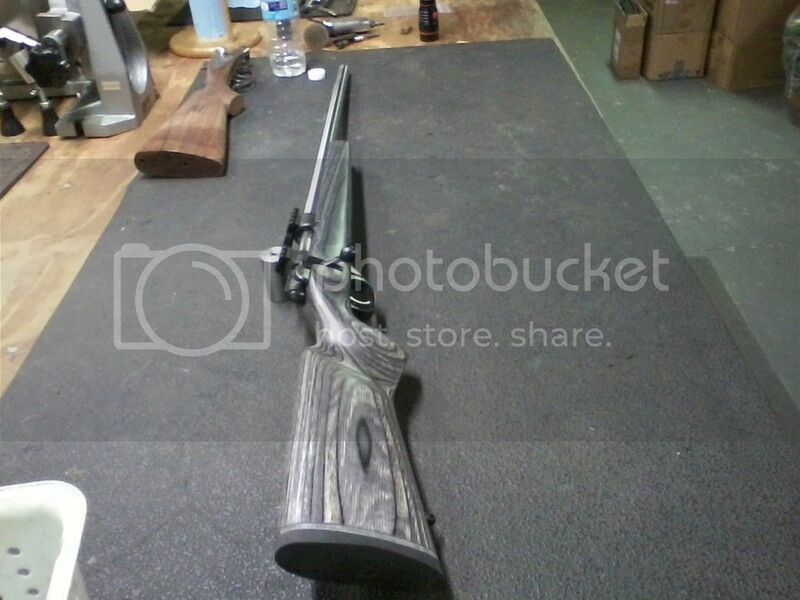 Barrel length on this one is 26" Bartlien 1:8 5r barrel, remington #2 varmint contour, free floated, dip 20 moa base. James calhoon single shot follower, cz low bolt handle. 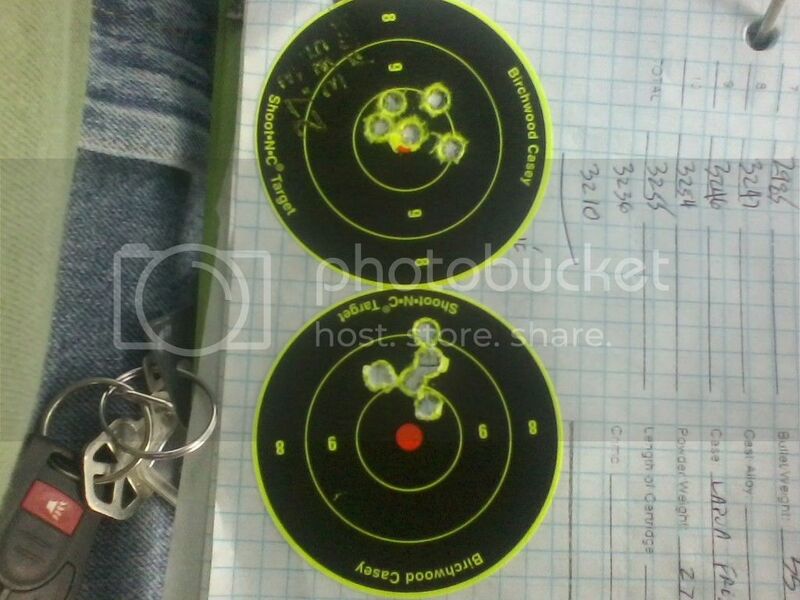 27 gr no pic 5 shots 1/2"
wow looks like a real shooter congrats on the build. 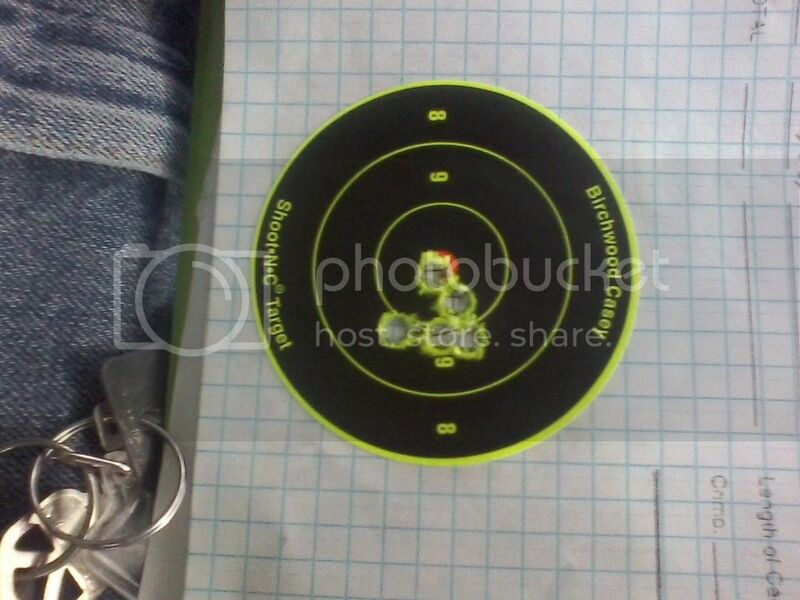 Not bad for a 7 1/2 cent bullet And fire form load. I'm pleased. The glass is crystal clear and bright, maybe a slight step down from my IOR..I'm impressed. The single set trigger on this is sweet. I'm feeling like a kid with new crayons. Then I get to see what it really likes. Did I say I Really like this rifle and caliber? No primer flattening cratering or hard bolt lift issue with the 28.2 gr load, primer pockets tight when I seated some with a rcbs hand primer. Velocity was 3350 with a 45 es at this load. Turned out great sir, nice work. Do you have any more range reports on this weapon? 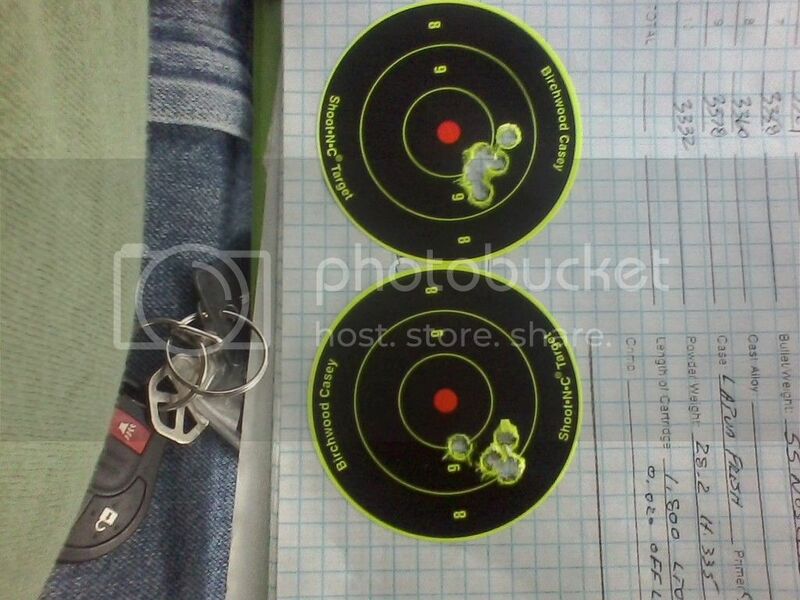 I am thinking of doing this to a Howa 1500 223. I haven't got back out, I have been busy, I managed to load up the 28.2 fireform loads in the lapua brass, but haven't shot it or done any load development untill I get fireformed brass to work with. Same sad story on the ar as well. I need to shoot to get brass to work with. After 3 shots in one ragged hole at 100 yds, I went out to 400 yds to shoot steel, the drop I thought based on a guess was not close (1.6 mils) it ended up being 2.2 mils. It shoots good, but those 55 gr boolits don't move that plate much or make much sound. Still have to shoot another 70 rounds to have all my lapua brass fireformed then I can see what it likes with a 105 amax. I'm going to swap out the scope for a moa 2 reticle as that scope got shipped to me.